Surf schools are a great way of learning how to surf quickly. Surf lessons are usually taught by instructed and certified surf teachers, in controlled and safe ocean environments. You should be able to learn to surf in between a week and a month. A good surf school will teach you to ride your first wave, after a five-hour practice. The International Surfing Association (ISA) is the world governing body for the sport of surfing, and has published an important document about surf schools. The "Obligations of a Registered Surf School" document is great to understand the main guidelines. Official ISA-certified surf schools must renew their registrations, every year. Soft surfboard models are longer, wider and heavier, so that beginners can easily take off in the initial waves. Beginner surfboards have higher buoyancy levels to allow surfing apprentices accessible stand-up training. The Expanded Polystyrene (EPS) foam adds durability. 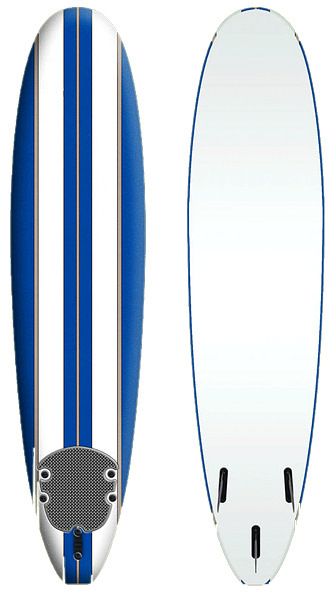 Beginner surfboards are quite affordable and can be purchased at around $250. Discover the best surfboards for beginners. Surf schools are the best option for those willing to learn how to surf quickly and enjoy the first rides of their lives. Would it possible to learn how to surf in 24 hours? Although it is always important to get tips and surf knowledge from a certified surf instructor, the answer is "yes." Discover how to surf in 24 hours. Also, learn how to duck dive in big waves. Read "The Beginners' Guide to Surfing." Do you want to start a surf school? Today, anyone can run a surf school, surf clinic or a surf camp. The first thing that should be taught are the basic rules of surf etiquette. Learn how to run your own surf academy. How to Choose a Surf School? Surfing is easy, and if you've decided to pay for surf lessons, then you did well. It's always better to have a fully trained surf teacher guiding you through the best ways to stand up on a surfboard. Nowadays, learning to surf is easier and faster because there are many surf schools and surf camps, in almost every coastal country. Nevertheless, pay attention to a few rules, before applying to a local surfing school. Each has country has its own legislation on safety sporting procedures. Surfing instructors have learned to offer you the best conditions possible. First of all, ask your local surf school how you will be taught. Some national surfing governing bodies and federations have strict rules for surf schools. One of the most important surf school rules is the coach/student ratio. Each class of one surf teacher should not have more than eight surfers. Surf schools that charge lessons that do not respect the 1/8 ratio rule are violating the official security procedures. Beginners should learn the primary skills of surfing: paddling through the break and onto waves, taking off in a wave, trimming across the face of a wave and turning/cutting back forehand and backhand. Surf coaches should be able to get an absolute beginner - who has never seen a board before - to a surfing level in which the rider has the ability to produce carving turns and cope with re-entries. Link to your surf school for €300 ($400) per year.